I'm only covering the more well-known and crossovery ones, but the Jungle Girl is a major trope. For more on the trope and a longer list of Jungle Girls, click here. 1818 to late 19th century--MONSTER IN THE MANSIONS--Frankenstein's Monster in the jungles of Rima. Publisher Tommy Hancock has informed me the novel picks up directly after the events of Mary Shelly's novel, and ends several years before the events of Green Mansions. August 1900--TALES OF THE SHADOWMEN--"The Mark of Kane (Angels of Music II)--Sequel to Kim Newman's homage to Charlie's Angels featuring classic literary characters. Rima the Jungle Girl is mentioned (as Riolama the Bird Girl). Also many, many other crossovers, far too numerous to list here. 1904--Green Mansions: A Romance of the Tropical Forest--Rima, a primitive girl of the shrinking rain forest of South America, meets Abel, a political fugitive. Rima has also been mentioned in Ray Bradbury's THE VELDT, Geoffrey Household's WATCHER IN THE SHADOWS, and Charlotte MacLeod's VANE PURSUIT, but I'm unsure if she is mentioned as being real or fictional in those stories. If anyone knows, please contact me. 1931--BLUE BOOK--"The Land of Hidden Men"--The story that introduced Nyoka, by Edgar Rice Burroughs. The story was later expanded the next year as Jungle Girl, and then adapted as a serial in 1941. The 1941 serial renames her Nyoka Meredith, but the sequel, the Perils of Nyoka, restores her real name, Nyoka Gordon. 1937--WAGS # 1--The first appearance of Sheena, Queen of the Jungle. ?? ?--DYNAMITE--The publisher has announced it will be teaming Sheena and Tarzan. It's unknown if it will be set in the 1930s era or the present day. 1942--THE PERILS OF NYOKA--It's intrepid Nyoka and her friends versus Vultura, Queen of the Desert, on a quest for the Golden Tablets of Hippocrates. 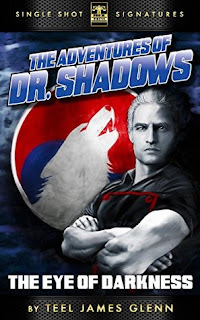 1940s--THE ADVENTURES OF DR. SHADOWS: THE EYE OF DARKNESS--There is a reference to the expedition of Dr. Henry Gordon, father of Nyoka the Jungle Girl, from the events of THE PERILS OF NYOKA. 1947--ZOOT COMICS # 7--First appearance of Rulah, Jungle Goddess. Summer 1953--THE FURTHER ADVENTURES OF NYOKA, THE JUNGLE GIRL # 1 - 3--Nyoka meets Chuck Ramsay, former sidekick of CAPTAIN MIDNIGHT. 1954--JUNGLE TALES # 1--First appearance of Jann of the Jungle. 1957--JANN OF THE JUNGLE # 16--"Fangs of the Black Orchid"--A villain in the story, who ends up being rescued by Jann, is named Higgins, and is drawn oddly resembling Higgins from Magnum, P.I., even though the story is published in the 1950s. The actor, John Hillerman, who plays Higgins on Magnum, was 25 at the time, and according to Higgins' continuity and timeline on Magnum, he was travelling the world at that time, so it works. It's just one of those occasional bizarre coincidences that makes for a crossover. 1972--SHANNA, THE SHE-DEVIL # 1--First appearance of Shanna. 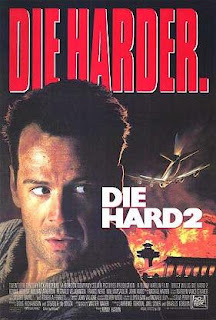 December 1990--DIE HARD 2--The evil dictator is from Val Verde, a fictional country also seen or referenced in COMMANDO, SUPERCARRIER, ADVENTURE INC., SHEENA, and all were written by Steven E. de Souza, who created the fictional country when he wrote Commando. CARTOON UNIVERSE--Jill of the Jungle is a video game character who has many video game crossovers which you can read about here. Another weird crossover is SCRIBBLENAUGHTS, a game where you can type in certain things and they appear, including Rima!!! For a full list, click here. Shanna the She-Devil appears with other Marvel characters in Marvel vs. Capcom. TVCU2--Perhaps this is the setting of the terrible BATMAN/DOC SAVAGE SPECIAL: BRONZE NIGHT, which takes pulp characters and sets them in the modern world. Featured besides the title characters are THE AVENGER, BLACKHAWK, RIMA THE JUNGLE GIRL, BLACK CANARY, and THE SPIRIT. Did I leave out your favorite Jungle Girl? Let me know who you would like me to add to this post in the future and make sure to provide at least one valid crossover to demonstrate her inclusion in the TVCU.